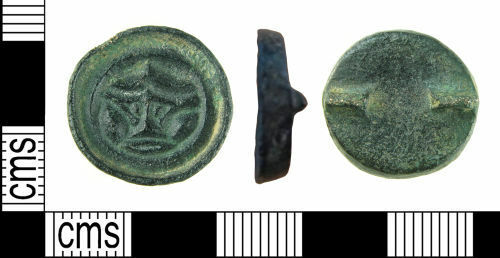 An incomplete copper alloy button brooch of Early-Medieval (Anglo-Saxon) date (c. 450-550), missing its pin, spring mechanism and curl of the catchplate (all old breaks). There is no trace of gilding. The brooch depicts a face within a concentric circle. An inverted V made of two inward-curving lines form the hair with the eyes below within a triangular area, against a triangular nose. The cheeks to either side are semi-circular and the mouth beneath is open and a pointed-oval in outline. The brooch measures 17.39mm in diameter at the top of walls, 14.76mm in diameter at the base of the walls inside and 17.12mm diameter to the reverse. The brooch is slightly oval in shape, measuring 17.39x16.85mm (underside 17.12x16.26mm). It stands 5.65mm high, the walls being 3.77mm high, and weighs 3.62g. Button brooches are distinguished by their small size and by the anthropomorphic face-masks which they feature. They may have been used in different ways as dress fasteners. It is thought that they may have been used singly rather than in pairs like the similar but larger saucer brooches. Button brooches are found throughout much of southern England and date between the later fifth and mid-sixth centuries. Reference: Suzuki, S, 2008; Anglo Saxon Button Brooches Typology, Genealogy, Chronology.